or whether specific members in a troop will appear. If a troop encounter condition is not met, then the troop will not appear. Similarly, if a troop member encounter condition is not met, then the member will not appear in battle when you encounter the troop. 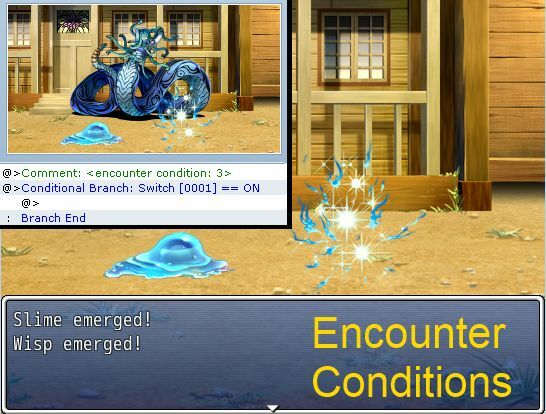 Encounter conditions are simply conditional branch commands, with a comment before them specifying that it is an encounter condition. They can be created anywhere in a troop event page, in any page. Then create a conditional branch command. That will be treated as the troop encounter condition. Troop member encounter conditions apply to the specific members in the troop. be the first enemy, 2 would be the second, and so on. Then you create a conditional branch as usual. If you would like to use multiple conditional branches, you would create your first conditional branch as usual, and then create additional conditional branches nested inside. This is good because it allows you to dynamically change the encounter rates.